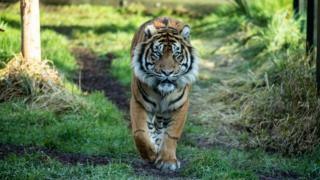 Sumatran tigers are the smallest of the five tiger subspecies and have the narrowest black stripes. The roar of a tiger can be so loud that it can be heard from two miles away (3.2km). A tiger can bite down with the force of 1,000lb (454kg). From sitting down, a tiger is able to leap forward 33ft (10m). Fossils found in China show tigers could have been alive two million years ago.